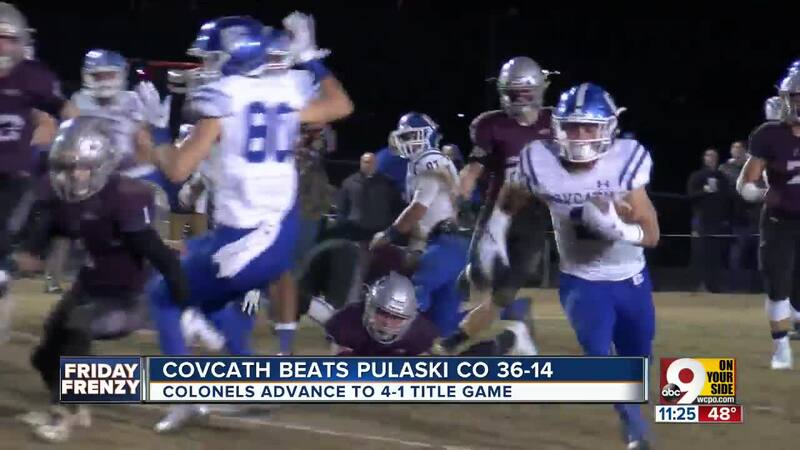 Watch the best high school football highlights in town hosted by WCPO’s John Popovich. This segment features top plays from Colerain vs. Pickerington Central and Winton Woods vs. Massillon Washington. PIQUA, Ohio – Get ready, Canton. The Colerain football team is returning to Stark County. The Cardinals defeated Pickerington Central 28-14 in a Division I state semifinal Friday night in front of an estimated 5,000 fans at Alexander Stadium. Colerain (14-0) plays Lakewood St. Edward (10-3) in the state final at 8 p.m. Nov. 30 at Tom Benson Hall of Fame Stadium in Canton. It is the Cardinals’ first state final appearance since they went undefeated (15-0) and won the title over Canton McKinley in what was then Fawcett Stadium in 2004. 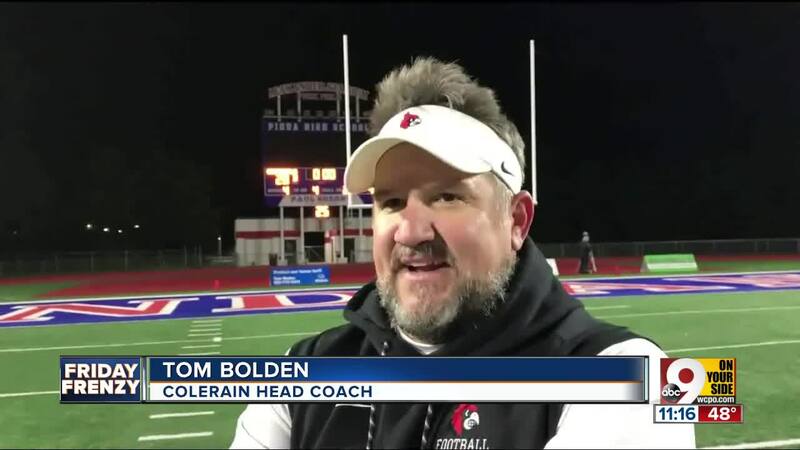 Bolden, the Cardinals’ head coach since 2007, was an assistant on that Colerain '04 team. There was nothing too flashy Friday night. Colerain operated a workmanlike approach the whole state semifinal. The Cardinals led 14-0 at halftime for a second straight week but encountered adversity early in the third quarter. On the second play of the second half, senior fullback/linebacker Ivan Pace Jr. twisted his left ankle and ran off to the sideline at the 11:01 mark. Pace missed a defensive series but was able to run on the ankle and work things out after being taped. He eventually returned to the game and said there was no way he wasn’t playing for his teammates. WATCH Colerain and highlights from other games in the video player above. Colerain led 14-7 at the end of the third quarter, but it was Pace’s 3-yard touchdown on fourth down with 8:33 left that helped to give the Cardinals a much-needed boost and a 21-7 lead. Pickerington Central (11-3) scored quickly nearly two minutes later to close the gap to 21-14. But, Pace and Smith-Moore led the ground attack on the final scoring drive to seal the game. Smith-Moore scored on a 1-yard touchdown run with 1:16 left, and the “We Are Colerain” chants had begun from the visitor stands. SEE High school football scores on WCPO Scoreboard. Colerain experienced sheer euphoria after the game as coaches and players embraced. They savored the moment. Pace rushed 25 times for 118 yards and two touchdowns. Smith-Moore had 64 yards rushing and two touchdowns. The Cardinals had 328 yards of total offense. Junior safety Deshawn Pace – Ivan’s brother – and sophomore linebacker Michael Bess had nine tackles each. Luke Bolden had eight tackles. Next week will be the first time Colerain will play Lakewood St. Edward in football, according to WeAreColerain. The Cardinals and their fans will certainly cherish the opportunity.